As the occasion called for, this Thanksgiving was one indulgence after another. 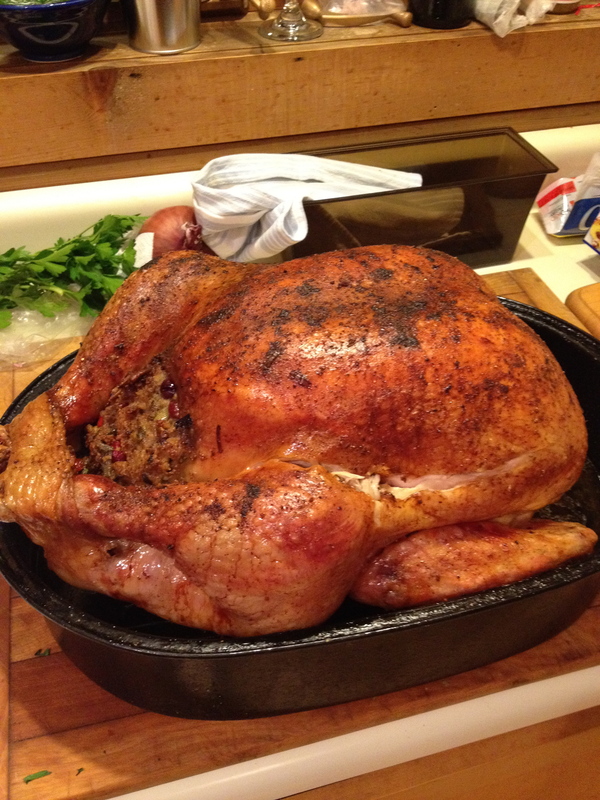 Gumbo, dark chocolate devil’s food cake, pecan tart, cornbread stuffing, Misty Knoll turkey, pear-pistacchio pie, mince pie, curry butternut squash soup. See what I mean? When we arrived in Vermont on Thursday more than a dusting of snow remained. 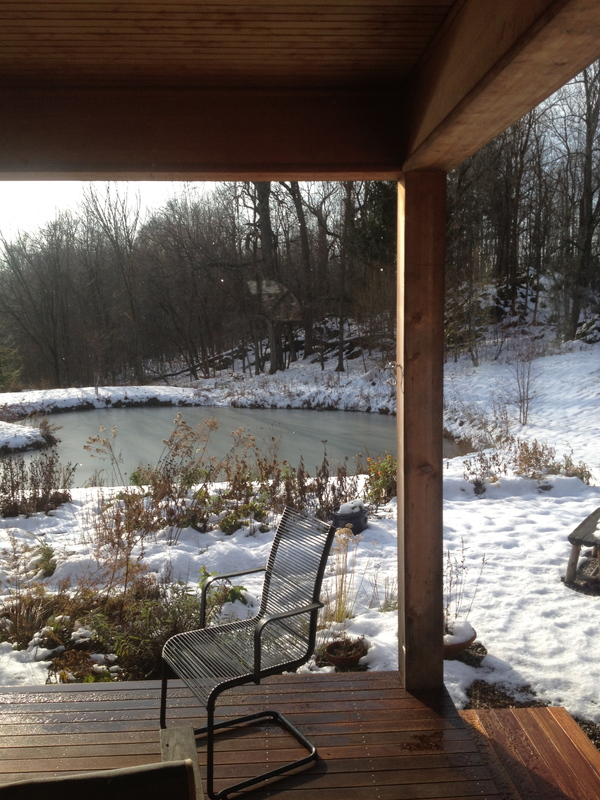 The photo above is a view from my dad and Bonnie’s back porch out toward the pond. 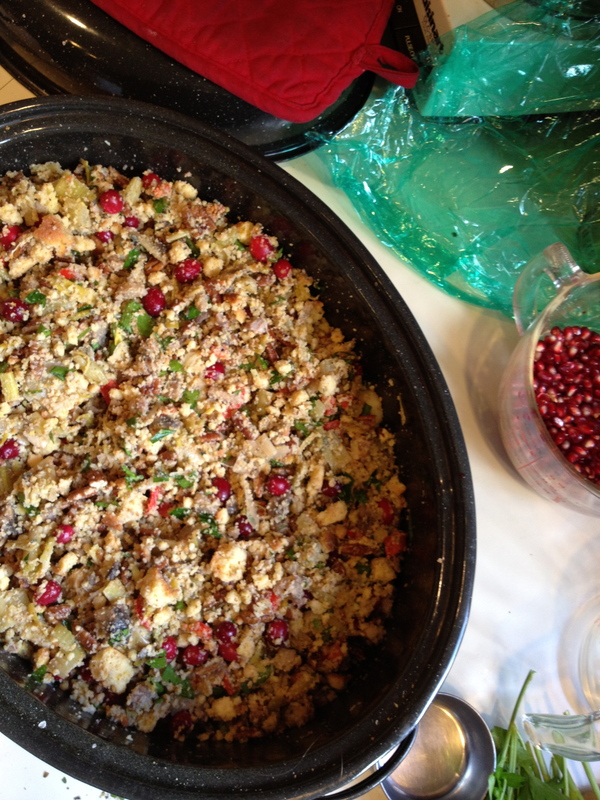 Each year there is mild debate about which stuffing we will make: my dad’s thymey-sagey breadcrumb with apple and sausage stuffing or my stepmom’s cornbread with cranberry stuffing. I like both but suppose I have a slight preference for the latter since I adore cornbread, and this year that is in fact what we had. 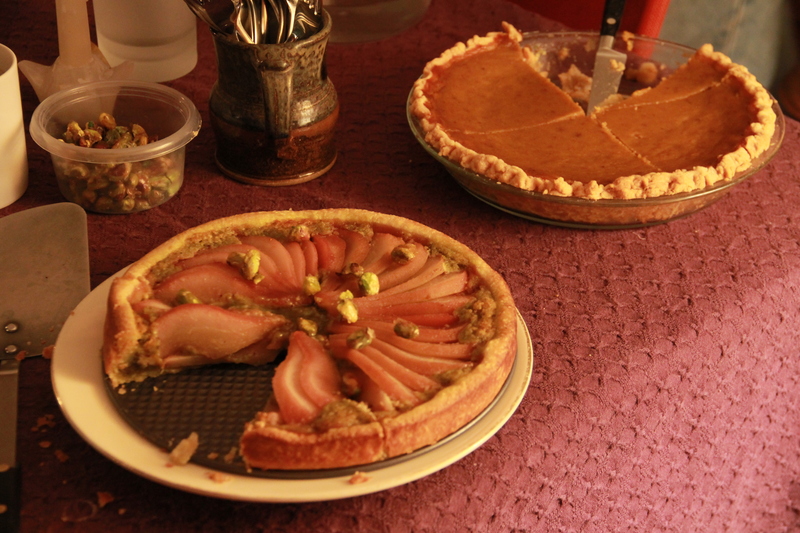 Bonnie’s sister-in-law is known for her pies and this year she outdid herself by making four: an apple, pumpkin, pear-pistachio, and mince, my grandmother’s favorite. My sister Hope’s birthday falls on the 28th of November (like John Stewart’s) and so each year we celebrate around Thanksgiving and I usually make a birthday cake. Since chocolate is kind of her thing and dairy is not so much her thing, it usually ends up being some chocolatey dairy-free concoction. 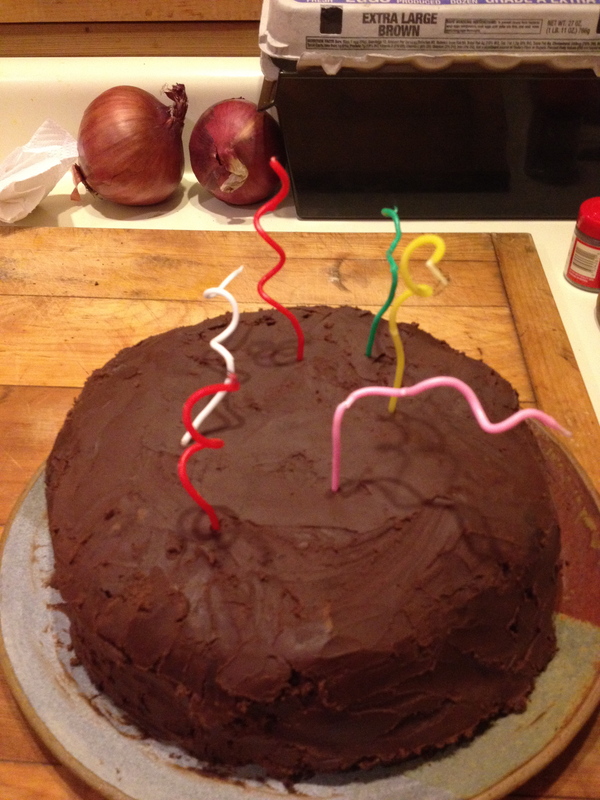 This year I was interested in trying David Lebovitz‘s Devil’s Food Cake; while not dairy-free per se, it seemed easy enough to substitute Earth Balance for the butter and soy milk or Lactaid for the milk. In the end the cake was a hit but I encountered a few stumbling blocks along the way. For instance, the recipe called for lining the bottoms of the cake pans with parchment paper, but I had none. So I greased and floured them well instead. But when it came time to wiggle the baked cakes out of the pans to cool they put up a good fight and the cakes started to come apart. In general I found the cake to be crumbly and wondered if this was just the lack of parchment or the Earth Balance perhaps? And finally, while I love dark chocolate, I found the overall cake and ganache frosting too be a little too dark, a result of using only 70% bittersweet cocoa bars. The cake’s darkness was fine, but next time, I’d mix the bittersweet with some lighter semi-sweet chocolate bars for the ganache frosting. Not that I heard any complaints from the birthday girl. 1. Adjust the oven rack to the center of the oven and preheat to 350 F.
2. Butter two 9″ x 2″ cake pans and line the bottoms with parchment paper. 3. Sift together the cocoa powder, cake flour, salt, baking soda, and baking powder in a bowl. 4. In a separate bowl, beat together the butter and sugar about 5 minutes until smooth and creamy. Add the eggs one at a time and incorporate. 5. 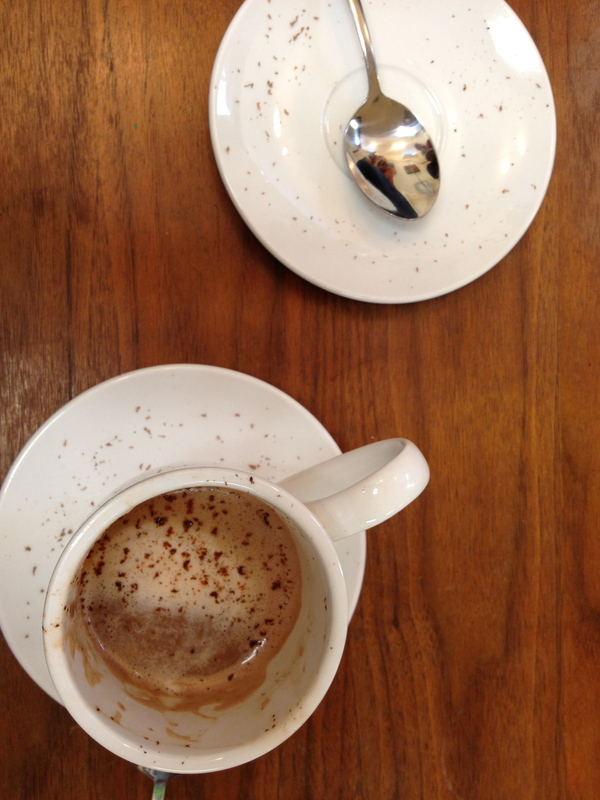 Mix together the coffee and milk. Fold half of the dry ingredients into the butter mixture, then add the coffee and milk. Fold in the other half of the dry ingredients to combine, but do not over mix. 6. Divide the batter into the two prepared cake pans and bake for 25 minutes, or until a toothpick comes out clean. Cool completely before frosting. 7. To make the frosting, melt the chopped chocolate with the water (or cream) in a double boiler. Remove the bowl from the pot of water. 8. Cut the butter into small pieces and whisk them into the chocolate until completely melted and the ganache is smooth. Cool until spreadable, which may take up to an hour at room temp or a quick cooling (5-10 mins) in the fridge. Frost the top of one layer of the cake and then place the other cake on top. Frost the tops and sides of the cake and serve the same day.